Our self-service laundry “Il Mastello” is provided with innovative equipment of ultimate generation. From us you can find everything you need for the cleaning and sanitation of your garments, saving time and money. The modern washing machines and dryers that we possess will allow you to wash even the most voluminous and bulky garments. In a short time you can carry out jackets washing, duvets washing, carpets washing, blankets washing, curtains washing, sheets washing, bedding washing for home, carpets cleaning etc. We make available to our clientele vacuum service, which will allow you to keep the best of your garments, optimizing the space inside of your cabinets and protecting them from dust. Our coin laundry Rome Center uses industrial machinery and professional dryers that will make it possible for you to wash and sanitize all the garments in a short time, thanks to the use of specific antibacterial detergents, accurately selected from the best brands on the market. Our coin laundry makes available to its clientele different loading capacities machineries, from 8kg to 13 kg, succeeding in satisfying every type of need. The hygiene is ensured by an automatic system who allows disinfecting the garments at each washing cycle. Inside of our laundry Rome you can enjoy a calm and hospitable environment and highly qualified staff who will be available to help you using the machinery correctly, or provide useful guidance on the most appropriate type of washing for you garments. Self-service laundry lets you use the washing machines at every hour of the day, guaranteeing/ensuring 24 hours in 24, succeeding in meeting the needs of a wide clientele. 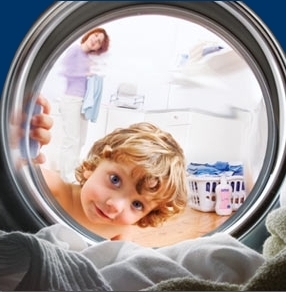 Self-service laundry Rome Center offers you the possibility to wash and dry in a short time even the most voluminous and challenging laundry, ensuring a neat/clean and perfectly sanitized laundry at the same time. Professionalism, courtesy and convenience are the hallmarks of our service. In no time you can wash all those garments that a home use washing machine doesn’t allow to wash properly or that would require multiple washings. Therefore, you can take advantage of a fast washing and drying service, thanks to the use of our professional machineries, which will save you time and efforts, above all. Our washer-dryer service Rome will let you wash all your beddings including comforters and duvets within an hour. Our service is addressed also to businesses such as hotels, bed and breakfast, hairdressers, restaurants, etc. The automatic sanitizing system, provides the assurance of a neat laundry, at much lower prices than traditional dry cleaners. You can also take advantage of our home service: we will occupy to withdraw your laundry and redeliver it clean, folded and ironed. Our service allows to wash large quantities of laundry at competitive and attainable/accessible prices. The quick bedding’s drying, also allows to have soft and sanitized garments avoiding the struggle of having to proceed to their ironing. Our self-service laundry Rome opens on Sunday and holidays are planned and attained for all those who have little time to devote to domestic activities, and who wish at the same time to be secured about an accurate and sanitized washing of their garments. Our goal has always been to provide a quality service, fast and accurate, being able to meet any kind of need and requirement. We pay a lot of attention to the environment’s cleanness and maintenance of our machineries. We also make available to the customers the service of shirt straightening, which is accomplished in a short time and at a low and advantageous cost.